Secrets, romance, murder and lies: Zoe shares a terrible secret in a letter to a stranger on death row in this second novel from the author of the bestselling debut, My Sister Lives on the Mantelpiece. Fifteen-year-old Zoe has a secret—a dark and terrible secret that she can't confess to anyone she knows. But then one day she hears of a criminal, Stuart Harris, locked up on death row in Texas. Like Zoe, Stuart is no stranger to secrets. Or lies. Or murder. Full of heartache yet humour, Zoe tells her story in the only way she can—in letters to the man in prison in America. Armed with a pen, Zoe takes a deep breath, eats a jam sandwich, and begins her tale of love and betrayal. 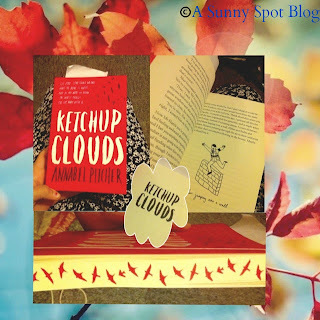 Ketchup Clouds was beautiful from it's gorgeous design to the luring tale inside. It was a great novel that deserves so much more attention and not only did it surprise me but it definitely surpassed my expectations. Ruby had recommended it to me a while back and even though my library had a copy I hadn't had the chance to pick it up. But when I went book shopping with a birthday voucher I couldn't miss the chance to get a copy as I am a sucker for a great cover and this was no exception. But the final product was more then a gorgeous design, it was a story that I will always remember. 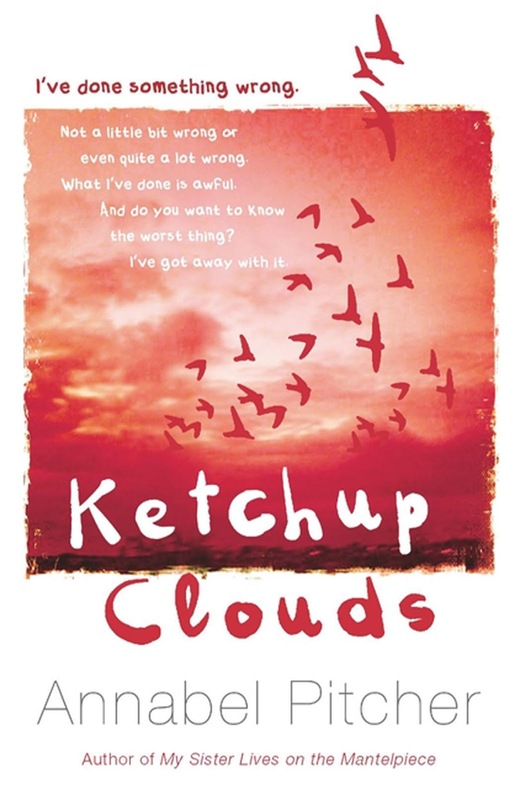 Ketchup Clouds was so original and something about it was significant without shouting "Look at me". You know those reads where whilst reading them you love them but when you reflect back on it wasn't all that grand? Well that certainly wasn't the case because the more I think about it, the more I want to re-read it. The blurb doesn't do justice to the engaging story which Annabel Pitcher has created and it didn't give me a clear idea of what it was about. So as you can imagine I was a bit hesitant to start it, to be honest. Saying that I would explain it to you, but it's just so hard to tell you what it's about in a way that will convince you to buy it - which you should. Having only a rough clue as to what Ketchup Clouds was about I was so surprised by the originality of the storyline, the unique characters and the writing style. Zoe (which isn't her actual name) was a great protagonist and one I really liked. Even when we didn't know what she had done and our mind was left to wander, she was still a really enjoyable narrator & we couldn't hold anything against her. I particularly liked the relationships she shared with her two younger sisters Dot and Sophie who were so sweet. I also loved Aaron, but I'll leave it at that. The way Pitcher had so vividly described everything made me feel like I was only in her world and I was completely lured in. Whilst I was curious as to what she actually did, the story was told more then revealed. Piece by piece so that while I wanted to know, I was simply enjoying the ride. It wasn't a tearjerker but it was quite a emotional book actually. It must seem like I'm sugar coating it all because it's quite a positive review. But whilst some very minor things irked me, I must admit. It didn't stop my overall enjoyment of the novel. It's a read I would recommend and I should point out that it is all in letter format which was quite a interesting change. But I think that with out the "From, Zoe"'s at the end, I probably wouldn't know because it was formatted very well. Contemporary fans will not be disappointed with this one and for some reason it reminded me of "Friday Brown" by Vikki Wakefield. I don't know how or why, but it did. Overall Ketchup Clouds is a engaging and original story that is totally underrated and one I really enjoyed. Okay, now I HAVE to read this book! 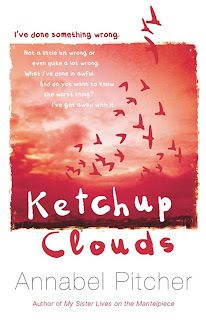 I saw it in a shop for £1.99 but I didn't have any money... so I am determined to go back there ;P Ketchup Clouds sounds so original and a beautifully written books. Tear-jerker reads are always powerful! Even though her REAL name isn't Zoe, it's still awesome that my name is in a book ;) Great review! it might annoy me that I don't get to find out what she did immediately but if it is told in a way that makes it gripping and not tiring, then I'll definitely be happy reading it. Also, you are right, the cover design is GORGEOUS! This does sound lovely, I'm so glad you enjoyed it! I've heard so many positive things about this book, and I've been wanting to read it for a while. The premise sounds so interesting and different, love your review! this was an amazing book, and an amazing review! totally following your blog.